In the late 1970s and early 1980s the fire community was pushing for reliable bench-scale tools to measure material flammability based on heat release rate. A measure of heat release rates was thought to be the most reliable and accurate measure of the flammability of a material. Unfortunately, only a few heat release measurement tools were available at that time and they were difficult to operate and the data was very inconsistent. In response, in 1982, the Fire Research Division at NIST (then called the Center of Fire Research at the National Bureau of Standards) introduced the next generation instrument to measure material flammability, the Cone Calorimeter. In, 1988, the Cone was awarded with a "R&D 100 Award", often called an Oscar on Innovation. This prestigious American award was given to the top 100 innovations of the year. It was the first-ever fire testing tool to be recognized by this award to NIST. In the mid-1980s, the Cone became commercially available. Today, there are now more than 300 Cones in-service worldwide and the Cone is the basis of more than a half dozen fire testing standards, such as ASTM E1354 and D5485, ISO 5660-1, NFPA 271, and CAN\ULC-S135. The Cone has become a reliable, accurate, and most common place methods to access material flammability. The Cone is a fire testing tool based on the principle that the amount of heat released from a burning sample is directly related to the amount of oxygen consumed during the combustion. The amount of heat a material generates is directly aligned with the severity of a fire, such as fire growth rate. In order to access the material flammability it is exposed to an external radiant heat source. Therefore, since this is a forced combustion test, the Cone values are most often thought to reflect flammability of a second item ignited. Shown below is a schematic of Cone. A sample is placed below a "cone" shaped radiant heater. Typically the samples are exposed to an external flux form the heater of 35 kW/m2. However, for more fire resistant materials the heater frequently increased to 50 kW/m2. Once enough pyrolysis products are generated, ignition occurs. The combustion product travel through the Cone heater and through an instrument exhausted pipe. 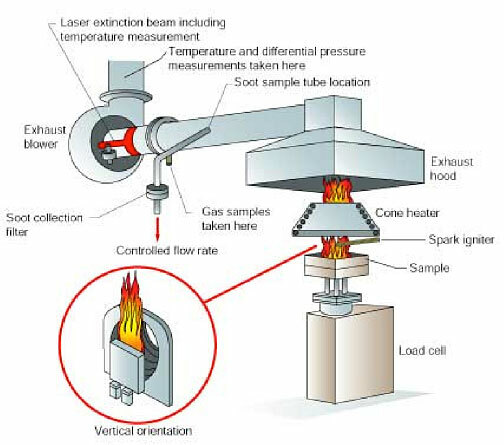 The values measured/calculated that are typically important include, but are not limited to, the time to ignition, the mass loss rate during combustion, time to and the value of the maximum amount of heat released during combustion, total amount of heat released during the test.